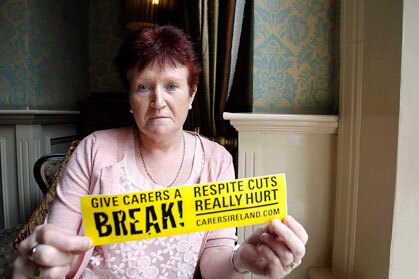 group in July protesting against possible budget cuts against carers this year. Here we are in the dog days of August when most of our politicians and top officials are on holidays and Ireland is half asleep. They call it the silly season here because there is so little news that the papers print all kinds of inane stories to fill space. This year is somewhat different, however. The reason is that this year, under the new timetable introduced by the European Union, we have to produce our annual budget in mid-October, two months earlier than usual. And the budget for 2014 is going to be another savage one which will be critical in our getting back control of our economy and turning things around. Behind those lazy days of summer when not much happens this year, there is frenetic activity going on behind closed doors as ministerial staff struggle to find ways of making the huge savings that our IMF program demands we make again this year. We're supposed to be near the end of the austerity program. Indeed, if you read some of the positive commentary on Ireland you might think that our problem is solved already and we are on the brink of economic recovery and normality. But the reality is the Irish economy is still flatlining and the state is still spending much more than we raise in tax, with the result that we are still borrowing €1 billion a month from the EU/IMF to pay for welfare, health and all the other government services that stop us from turning into Greece. The budget this October is critical because although we have made progress in closing the tax/spending gap, we still have a distance to go and time is not on our side. By next January Ireland is supposed to be out of the EU/IMF program that has been propping us up for the past few years. Over the past three years we have borrowed over €60 billion under the program to avoid national bankruptcy and collapsing as a failed state which can't pay its bills and its debts. The problem we face now is that the spending cuts and tax hikes we have endured in every budget over the past five years have made it progressively harder to find ways of narrowing our budget gap. There is very little budgetary fat left. It's now down to hard choices. And this year, with another €3.1 billion reduction due in cuts and/or tax hikes under the program, it's going to be harder than ever. A ferocious debate is going on behind the scenes in the civil service and between the two parties in government, Labour and Fine Gael. The Labor view is that further cuts and tax hikes of this magnitude will mean our economy will continue to flatline and any chance of growth will be snuffed out. Taking that much out of the economy at this time is counter-productive, they say, and they are supported by some Fine Gael backbenchers who are feeling the pressure from their voters. This view is even supported by a former IMF senior executive who was involved in our bailout. Another factor in the debate is the fact that the state promissory note deal, which greatly lengthened the repayment period for about half of our total borrowing, means that our repayments for this year will be about €1 billion less than we had expected. So we have a choice. We can use this to get further ahead on our debt repayments or we can use it to make the budget this year softer by modifying cuts in spending. The strong view of the EU/IMF is that we should stick to the agreed program and use the money to reduce debt (by having to borrow less). The official Fine Gael view is in agreement with this tough line. We need to press on and "finish the job" even though it's painful. When we emerge from the IMF/EU program next year we have to be able to borrow on the international money markets, and any backsliding now could send out a wrong signal that could put this in jeopardy. On balance, the Fine Gael view is probably correct. Yes, it's true that taking even more money out of our economy now is going to depress things even more. But using more borrowed money for welfare payments to prop up the domestic economy is not the answer either and will make things worse in the long run. Much more important for our recovery are the signs of a slight recovery in Europe. Higher demand in Europe will stimulate real growth here in exporting businesses. And that's real money and jobs that last. There is general agreement here that tax rates are now at a level that means any further hikes will have a seriously depressing effect on business activity and job creation. That does not mean there won't be any tax hikes in the budget. But it does mean that most of the adjustment in the October budget will have to come from cuts in state spending. Let's say that some kind of compromise is worked out between Labor and Fine Gael to hold the government together, and that instead of making a €3.1 billion adjustment in the budget, they use a third of the €1 billion promissory note “saving” to reduce the adjustment to €2.6 or €2.7 billion. That may be risky. But it will reduce the pain somewhat, although major spending cuts in big state departments like welfare, health and education are unavoidable. Already leaks from official sources have been revealing what may be coming down the tracks. A cut in unemployment payments, in child payments and in old age pensions have all been floated and have generated outrage from those who would be affected. What this ignores is that all these welfare payments are much higher than in most other countries in Europe and particularly in comparison with our nearest neighbor, Britain. Let's take the old age pension as an example. For a person who has worked and paid taxes all their lives, the state pension here is €230 a week or just under €12,000 a year. In Britain, it is £110 a week, which is equivalent to around €128 a week or €6,700 a year. So pensions here are almost TWICE the level of pensions in the U.K. -- and this after years of Labor governments in Britain! This huge gap is replicated across other main welfare areas like payments to people who are out of work and payments to families with children, with Irish rates much higher. For a country that is effectively bankrupt it is a remarkable situation. All kinds of reasons are advanced for why welfare payments need to be higher here (the cost of living, etc. ), but the reality is that most of these arguments are less than convincing. Is living here really all that different from living in the U.K.? The real reason why welfare payments here are much higher is that a boom time overhang still exists, both in pay (try hiring a plumber at less than €25 an hour) and in welfare payments which got big rises in rates during the boom as the government splurged on spending. Of course you won't get many people here to admit this, and such statements of reality even provoke outrage. There was fury two weeks ago when word got out that one of the options being discussed behind closed doors is a €10 cut in the old age pension. That would still leave pensions here more than a third higher than in the U.K. But there is such a fear of a grey voter backlash that ministers were lining up to deny that this was an option. The fact is, however, that Ireland is no longer a rich country and we need to accept that in both welfare and pay levels. International commentary on the Irish bust frequently wonders why Irish people have accepted the austerity program without reacting like the Greeks with street demonstrations and so on. The answer is that our welfare levels and state services still provide a standard of living and even comfort that protect us from reality. And if this changes we might well see a much more aggressive Athens-style response. That is one reason why the government is proceeding with caution. But the reality is unavoidable. At the end of 2013 Ireland's net debt will be well over 120 percent of national income, a level regarded as unsustainable. And we will be adding to our debt pile for at least another five years (and possibly longer) until we can get the state finances into some kind of balance again. As one senior economist here observed recently, "It is bizarre that continued borrowing, which will add to this debt mountain, is routinely described as austerity." But routine borrowing will be the norm for Ireland for years to come, some economists say until at least 2020. And that borrowing will have to come from the money markets at reasonable interest rates. To get reasonable rates we will have to be able to show that our budget deficits are continuing to come down and that we are keeping up with out debt repayments. The first step in convincing them will be to stick to the program in the coming budget. Of course there are other ways of trimming the deficit instead of cutting welfare and health and education services. But these involve chopping state spending on a wide array of untouchable state institutions and civil service elites and state supported quangos, all of whom claim to be "essential." That's a whole other story which we will be exploring here when the axe starts to fall.